and on Self Defense for everyone. “Kali is only good if you carry a stick around with you.” Gotta thank M.A. for mentioning that she heard this from someone in relation to Filipino Martial Arts Practice. It’s a common comment from observers who see us clacking away or twirling and doing disarms. It’s even a little more disappointing when you hear that it’s a Filipino who says it, after all, it is their native martial art. I am not Filipino, but I am unapologetically biased for it. So is the comment a valid point? Hardly. For one, it’s not a “stick” martial art, it’s a fighting art. It encompasses weapons and more: matched and unmatched weapons, unarmed vs weapons, unarmed vs unarmed with striking and grappling, ground fighting, partner fighting and multiple opponents. 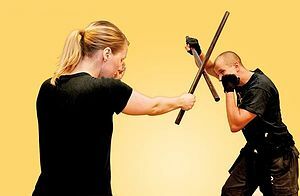 In my experience it’s one of the least segmented martial arts; one combative action may include a weapon for weapon counter, disarm, hand strikes, re-counter, kicking, joint lock, limb destruction, take-down to finish. You learn all this almost simultaneously. Train TaeKwonDo and you’ll be kicking without learning take-downs anytime soon, take Jiu Jitsu and you won’t be learning punching that first month, take boxing and you won’t know what to do when someone bear hugs you, and on and on. Within a handful of classes my students are striking with and without weapons, kicking, locking, taking down.